Little Marc must find a way to win the school talent contest, but first he needs a skill. Inspired by the great Harry Houdini, he chooses magic. Marc’s persistence and faith pay off. After dazzling the crowd with one trick after the next, he delivers his best act last. Marc’s final surprise shows children the importance of thinking of friends in need and believing in oneself. 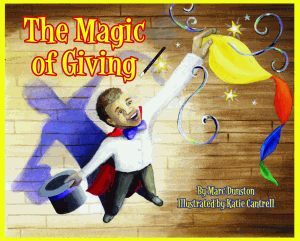 Marc Dunston is the host and executive producer of The Magic Marc Show, a program combining magic and education for kids to create “magication.” He has performed magic shows for such celebrities as Bill Cosby and Jack Hanna. He lives in Savannah, Georgia. Katie Cantrell is a student at the Savannah College of Art and Design working toward her BFA in illustration. She has provided artwork for Strathmore Artist Papers, Threadless, and the Savannah College of Art and Design.